WILLEMSTAD - Three people were arrested during a large police check on Sunday evening. The controls were on the Way to Santa Cruz, the Way to St. Willibrordus and to the Kaminda Frank Curiel. Two of them for the marijuana plants in their cars and one because he did not want to cooperate with the police officers. 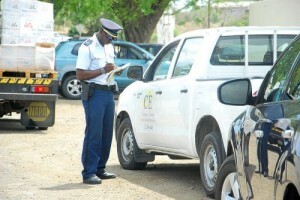 In total 17 fines were handed out because the car documents were not in order. 9 cars were transported to the police headquarters with the tow truck.